The Kawasaki Ninja 400 is about a lakh costlier than its younger sibling, the Kawasaki Ninja 300. The bike manufacturer will assemble the Ninja 400 at its Chakan plant in limited numbers only. Kawasaki has today launched the Ninja 400 in India. The sportbike will find its place above the Ninja 300 in Kawasaki’s product line-up in India. The bike made its first public debut at 2017 EICMA motorcycle show in Italy. Kawasaki is going to manufacture the Ninja 400 in India at its Chakan plant. Furthermore, only limited numbers of this bike will roll out of this facility for India. 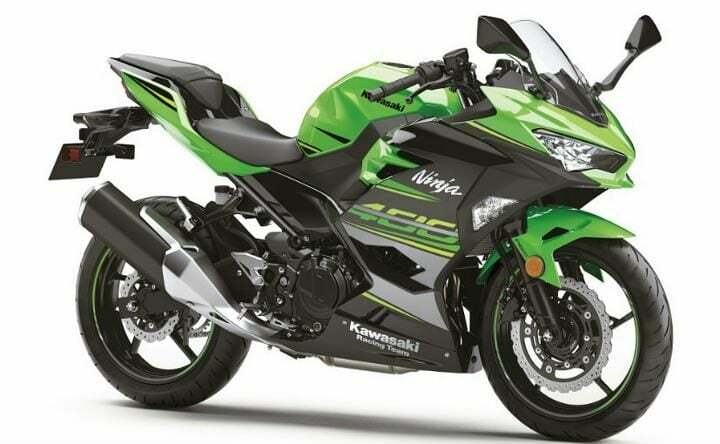 In addition to this, the Kawasaki Ninja 400 is available in India only its the KRT edition. Bookings for the sportbike is already open. The Kawasaki Ninja 400 will cost you INR 4.69 lakh to own in India. This price is ex-showroom, Delhi. Consequently, the Ninja 400 is about a lakh costlier than the Ninja 300. The latter still continues to be Kawasaki’s flagship model since the 400 is restricted to a limited number only. The Ninja 400 comes with a 399cc, parallel twin engine. This motor produces 44.8 BHP along with 38 Nm of peak torque. The bike comes as standard with a six-speed manual transmission. Also Read: Kawasaki Versys X-300 vs Versys 650 Comparison – Sibling Rivalry! The Ninja 400 employs 41mm telescopic forks up-front. While the rear comes with a monoshock suspension. The sportbike comes with 310mm disk brakes on the front wheels. Consequently, the 400 has the largest front disk brakes in its segment. In contrast, the rear wheels get 220mm disks. The bike comes with ABS as a standard feature. The bike is based on steel trellis frame. Consequently, this helps in improving its riding dynamics. Furthermore, the kerb weight of the 400 is 168kgs. While the 300 is about 6kgs heavier. The Ninja 400 comes with a new analogue-digital instrument cluster. It also comes with LED daytime running lights, LED tail-lamps and a new exhaust canister. The owner can also put a number of add-on accessories to the 400. These include pillion seat cowl, helmet lock, radiator screen, tank bag and tank pad. With this price, the Kawasaki Ninja 400 competes with the likes of Yamaha YZF-R3, KTM RC390, TVS Apache RR 310 and the Benelli 302R. Like what you read? Do give us your feedback in the comment section below. Feel free to ask questions is any. Keep following Car Blog India for all the latest happenings in the Indian auto industry.